NC AgrAbility Project Coordinator Michele Proctor, in collaboration with NC Assistive Technology Program Executive Director Tammy Koger and NCDHHS Division of Vocational Rehabilitation Engineer Steve Brink, presented a new lecture session to NC State University first-year engineering students entitled "Rehabilitation Engineering, Assistive Technology and NC AgrAbility". Invited by Dr. Andy Hale, 40 students learned about potential applications for their engineering degrees in the fields of assistive technology and rehabilitative engineering, and how those are applied with AgrAbility concepts to assist farmers with disabilities. The lecture was created as the result of a strong interest from engineering students looking for ways to get involved in AgrAbility or in rehabilitation engineering for farmers. 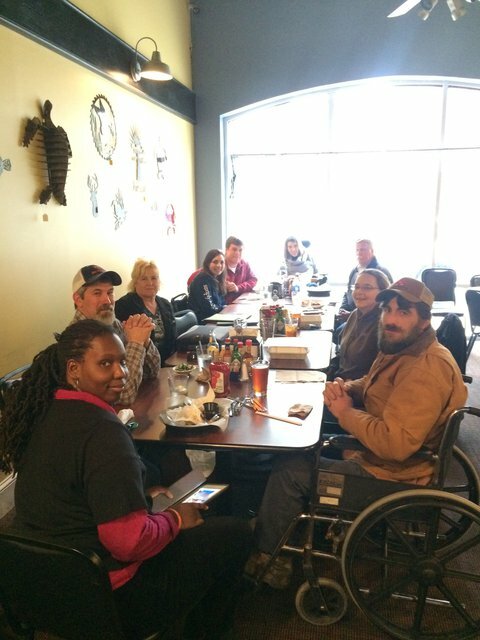 NC AgrAbility hosted the spring Eastern Peer Farmer Lunch at Grub Brother's Eatery in Little Washington on March 19th. The group enjoyed meeting other AgrAbility farmers, including a new AgrAbility family, and heard updates about state and national AgrAbility news and events from project coordinator Michele Proctor. Gloria Jinks with the NC Assistive Technology Program presented a short session about NCATP services and assistive technology for agriculture. NC Agromedicine Institute Director Robin Tutor-Marcom shared information about eligibility for cost share assistance for assistive technology for AgrAbility clients. 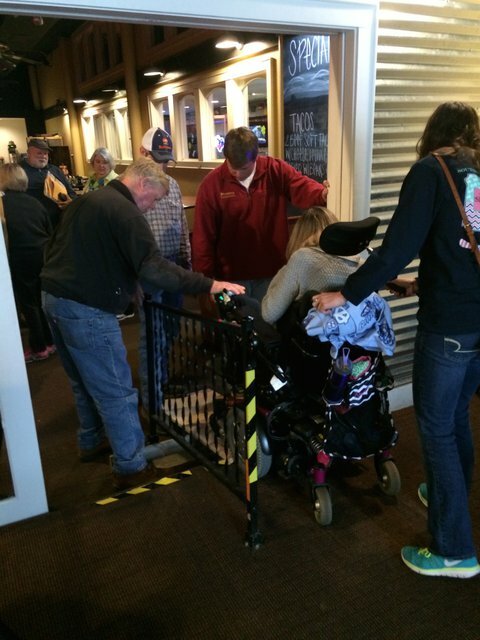 The group faced a unique challenge when the restaurant did not have accessible means of egress for a powerchair user to the group dining area due to a step. Thankfully, Michele and Gloria made a quick dumpster dive across the street at a construction site and together with the farmer's family were able to construct a make-shift ramp from plywood and concrete slab remains to allow the client access to the group dining area! NC AgrAbility would like to thank all the farmers and their family members who joined NC AgrAbility for a great day of fellowship and sharing! Michele Proctor participated in the 2015 North Carolina Small Farms Week Curbside Consulting, hosted by North Carolina A&T State University in Greensboro on March 24, 2015. 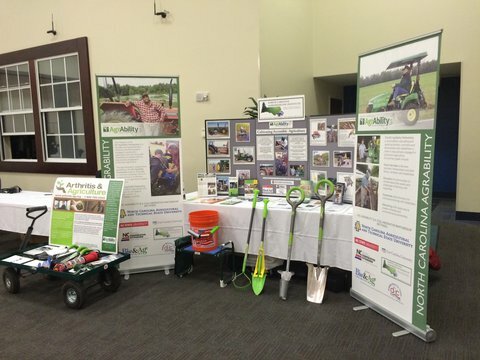 Michele had a display of assistive tools for gardening with Arthritis or disabilities as well as educational materials. Participants were able to stop by and get one-on-one consultations with Michele about accommodating their own needs. Project Coordinator Michele Proctor presented the 'AgrAbility' session at the 2015 NC Agricultural Medicine Core Course at the NC Research Campus in Kannapolis, NC, on March 26, 2015. The session was presented live to students and also broadcast live to distance education students. Participants learned about AgrAbility services, understanding considerations when assisting rural individuals with disabilities compared to assisting in urban environments, and adaptive solutions for farming with disabilities. Co-hosts/presenters also participating in the session included Robin Tutor-Marcom and LaMar Grafft with the NC Agromedicine Institute, and Dr. Kelly Donham with the University of Iowa. NC AgrAbility has been integrated into the NC 'Core Course' since 2012.